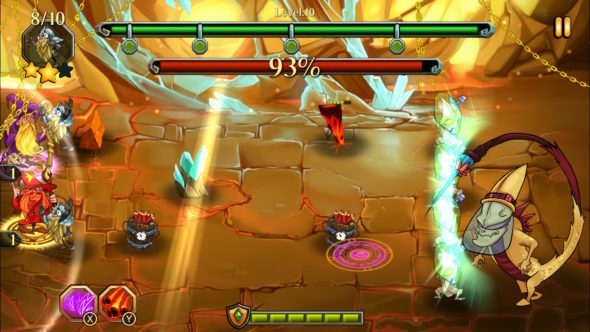 Last month, Art Alliance and Kool2Play Studio released a new game called Dungeons & Aliens. The game is heavily inspired by games such as Plants vs. Zombies, yet we assumed that the developers decided to give their own original spin to it. When having a first look at the game, you will quite quickly notice that you will be playing as a wizard that has to take on Aliens that are invading your lands. So, if you are curious what more Dungeons & Aliens has to offer, and whether the developers succeeded in their quest to make this game outstanding, quickly, start reading before the Aliens are getting too close. Dungeons & Aliens doesn’t have the most special or intriguing story. However, when you launch the game you will find out that unearthly beasts (Aliens) are invading the city of the Gnarlins, and that wizards are going to try to stop them. The story is brought to you by pictures with text. There is some kind of voice-acting that comes along with it, but you won’t understand it because it’s just some mumbling. You will encounter these story moments at the beginning of the game and when you reach certain levels and unlock something new to help you fight the Aliens. The story is simple, and fits the simplistic style of the game. However, they could have spiced it up a little by adding a ‘real’ voice instead of the mumbling. The game has a cartoony 3D look. The setting that you are playing in is in some ways very similar to the one from Plants vs. Zombies. Only this time the developers put some time in the graphical design and paid great attention to the small details of the game. Not only the characters but also their attacks look fantastic. Mostly, you will find yourself playing in a dungeon, which is, just as everything else, looking just fine. While playing the game you won’t experience any bugs or lags, and this counts for both handheld mode and TV mode. It keeps delivering in a beautiful way. The main soundtrack that is playing throughout the game provides a vibe that brings you back to the medieval times. The sound matches what is graphically shown onscreen, being wizards and such. When starting a match, the sound changes in order to provide a more battlefield kind of vibe. In addition to this, there are the sound effects, which are all thought well-through. For every basic attack and every special attack there is a special sound, providing a complete feeling. As mentioned before, there isn’t really any specific voice-acting, but just the mumbling sound that is made when they are trying to give you some more information about the story. This can be seen as a bad thing since it really drags everything down a bit. Spoken words would have made everything even better than it already is. 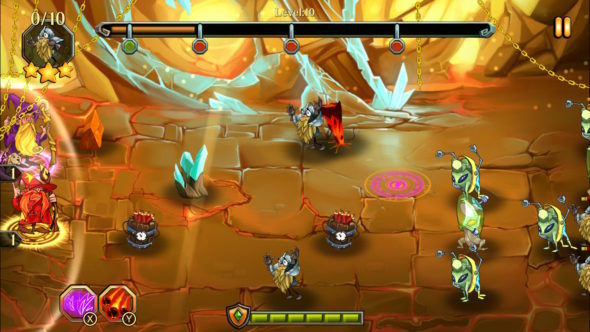 Dungeons & Aliens is tower defense game which shows a lot of similarities to Plants vs. Zombies. It is your goal to eliminate Aliens who are coming for your base, while rescuing your Gnarlings from them. When you first start playing, you will play as one wizard who attacks the incoming aliens. You can do this by using basic attacks, which are simply fired by placing the cursor over the incoming Aliens, or by special attacks. In order to fire a special attack, you will have to buy them. 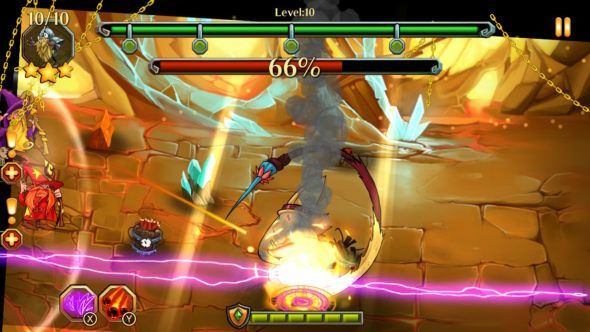 For example, if you buy five special attacks, you can use them five times at any moment you want. Like mentioned before, it is your goal to eliminate all the incoming Aliens by emptying their health bar. Some waves of incoming Aliens will also have certain ‘bosses’. These bosses can give health to already incoming Aliens or spawn new waves of them making it harder for you to survive. At certain points in the game you will unlock two other wizards to help you fight the Aliens, so in total you can attack with three wizards at once, making you are stronger. There is a second way to get stronger as well. You can buy certain upgrades in the store so you can make your basic attacks and special attacks stronger. 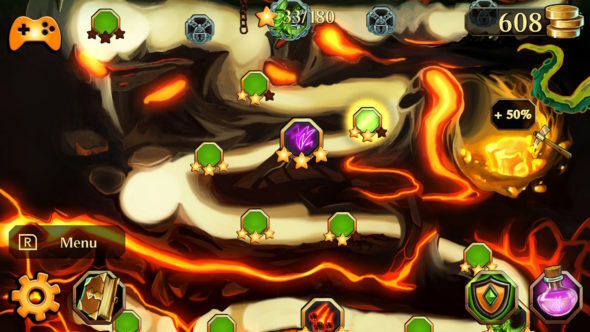 You can also improve the armour of the obstacles that are placed on the map or you can gain more health points for your base. The upgrades are paid for with coins which you earn after you complete a match. In order to complete or finish the game, you will have to go through all the levels, and earn three stars in every single one of them. In total you will be able to earn 180 stars throughout the game. This also means that you can take as long as you want in order to finish the games. If you prefer to keep farming coins to buy upgrades and advance easier, you will be playing longer than the ones who are willing to take the challenge and move forward with limited resources. Where at first glance, it may look like the game is a rip off of the Plants vs. Zombies games, this is not the case. The gameplay manages to give this game something unique and special and provides a complete and challenging feeling to the game. 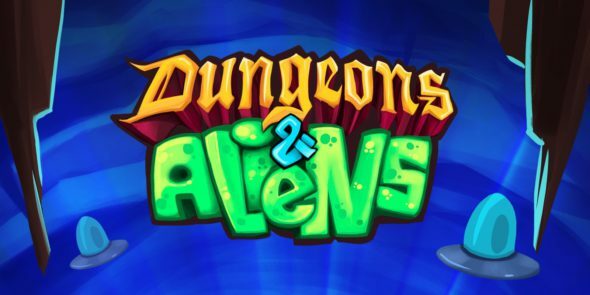 Dungeons & Aliens is a fantastic game to have in your Switch library. Starting with the small story, it manages to be something different, which is completed by the beautiful graphical aspect that the developers over at Art Alliance implemented in it. Imaging this with a soundtrack that is nice to hear and great gameplay, and the game just feels complete. The only real downside that the game has is that there isn’t really voice-acting in it, just a bit of mumbling.